Saying that Middle Eastern Christians facing persecution have not been served well by the United Nations, Vice President Mike Pence announced on Wednesday that the Trump administration will direct money away from the international body and instead disperse it to faith-based and other nonprofit organizations. 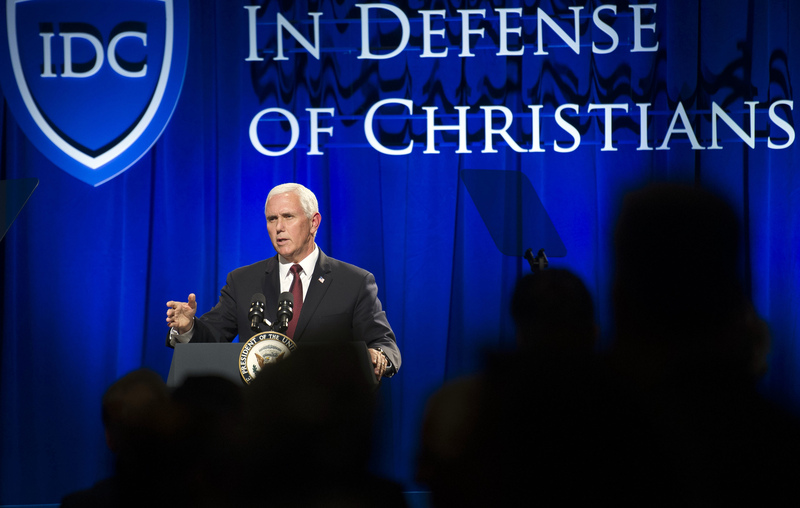 “Our fellow Christians and all who are persecuted in the Middle East should not have to rely on multinational institutions when America can help them directly,”the vice president said at a summit in Dallas hosted by In Defense of Christians, a D.C.-based nonprofit that advocates for Christians living in the Middle East. “And tonight, it is my privilege to announce that President Trump has ordered the State Department to stop funding ineffective relief efforts at the United Nations,” he continued. “From this day forward, America will provide support directly to persecuted communities,” through the United States Agency for International Development, or USAID. Carl Anderson, the head of the Knights of Columbus who has previously met with the vice president to discuss anti-Christian persecution, welcomed the news. “My friends, those days are over,” he said. Ms. Nauert said she was unable to provide data supporting claims that U.N. programs are inefficient and said she was unsure how much money would be diverted. Earlier this year, the president proposed sharp cuts to USAID, which in fiscal year 2016 spentabout $19 billion on international aid, equivalent to less than 1 percent of the United States’ total budget. Mr. Pence did not address the potential cuts during his speech. A representative from C.R.S. said the organization was studying Mr. Pence’s announcement and that it could not comment on specifics, but she reiterated that C.R.S. helps vulnerable people regardless of religious belief. For its part, Jesuit Refugee Services also said it was still processing Mr. Pence’s announcement—though the organization voices support for U.N. refugee programs. Shaun Casey, a former State Department official who now heads the Berkley Center for Religion, Peace, and World Affairs at Georgetown University, toldThe Atlantic he believes the policy change is an attempt to divert attention away from the proposed cuts to international aid, by appeasing Christian conservatives who form Mr. Trump’s political base. “They could absolutely devastate the global USAID budget, but if they come up with $10 million to put in the hands of a group of conservative Christian N.G.O.s on the ground, that’s how they’re going to take credit,” he said. During his address, Mr. Pence painted a bleak picture of Christians living in the Middle East,a frequent theme in his talks. He also announced he would visit Egypt and Israel in December. Absent from the vice president’s Oct. 25 speech was the Trump administration’s stance toward refugees from some of the countries where Christians are facing some of the violence he spoke about, including Iraq, Syria and Egypt. Though the vice president said in his speech “America will support these people,” meaning Christians and other religious minorities facing persecution in the Middle East, the day before, on Oct. 24, the administration announced stricter restrictions for refugees wanting to come to the United States from 11 countries. Though the countries were not named, news agency Reuters reported that they were mostly from the Middle East and Africa, which in the past included many persecuted Christians seeking refuge in the U.S. In late September, Bishop Joe S. Vasquez of Austin, Texas, who is chairman of the U.S. Conference of Catholic Bishops’ Committee on Migration, voiced objections about the low level of refugee admissions under Trump, who will limit the number of refugees the United States accepts to 45,000 for the upcoming fiscal year. It is the lowest admission level for persons fleeing persecution that the United States has accepted since the 1980s, when the executive branch was allowed to set the caps under the Refugee Act. Material from the Catholic News Service was used in this report. Good luck with that. Poor and marginalized Christians in the U.S. aren't even being taken care of. A special thanks to the Supreme Knight for helping Trump get elected. We have heard so many lies who can believe anybody in this administration. A key point in the article - "Mr. Pence’s announcement LACKED SPECIFICS about how much money would be funneled away from the United Nations or about which groups might receive increased funding from USAID." Are peaceful/persecuted Jewish and Muslims included in this aid? All Trump initiatives lack specifics. Mr. O’loughlin, as a good national correspondent, you are aware that we readers will expect you to follow up with the State Department relentlessly until you find out the specifics of this strategy, and then follow up equally relentlessly with the execution ( or perhaps quiet abandonment) of it. Michael J. O'Loughlin is America's national correspondent.